Successfully Added FlashMax X910 - CREE LED Flashlight (900 Lumens, Waterproof) to your Shopping Cart. The new FlashMax X910 high performance LED Flashlight. It comes with 900 lumens of bright white light, is waterproof, and comes in a COMPLETE KIT containing the flashlight, 2x high mAh rechargeable OEM Ultrafire batteries (2400mAh each! ), and a charger. Available at a factory-direct China Wholesale Price, the Flashmax X910 is the one Cree LED Power Flashlight that every hobbyist should have in their garage. Powerful: The secret behind this amazing new flashlight - it uses LED's manufactured by CREE, the industry leader in bright white light emitting diodes. The benefit to you: high intensity beams (900 lumens) you can always rely on whenever the need arises. More importantly - LED Flashlights shine brighter and use less energy than old tech like halogen / incandescent, meaning you can keep this on the shelf or in the glove box for a long time and it will still have power whenever you pull it out in an emergency. And since it uses two 18650 Ultrafire OEM batteries, you have enough power for hours of continuous use. Durable: The Flashmax X910 LED Flashlight casing is made of a precision machined dura-strength aircraft grade extruded aluminum that has been given an anodized finish for the maximum in corrosion resistance. The benefit to you: a high performance device that easily withstands industrial use wear and tear like no other! Flexible: Waterproof design and rubber-encased tail clicky allow you to use this in any environment and weather condition. With 5 different light modes, you could use this for lighting paths, searching wilderness, signaling for assistance, or even communicating with others. 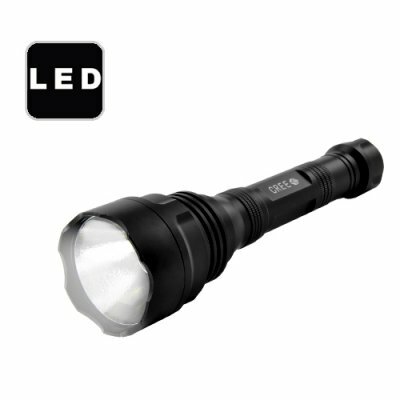 This is the perfect tool for security officers, park rangers, sheriffs, university mechanics, adventure tour guides, presidential guards, or anyone else needing a high performance LED Flashlight for use in their daily work. If you need a powerful, durable and flexible LED Flashlight for your work or even home use, then there is only one clear choice - the Flashmax X910. This new model is in stock now for single piece or large bulk orders. Provided as model number CVNY-G261, it is being sold as a complete kit with rechargeable batteries and charger. Chinavasion sells the Flashmax X910 and all the other Flashmax series LED Flashlights at the lowest price on the internet. Shop for yourself, you will not find a lower price for anywhere on the internet! Better still, these are in stock in our warehouse right now - so if you order one today we will ship it out tomorrow! Only from chinavasion.com. Great News: comes with two free rechargeable 18650 batteries and charger! Excellent Resale Item, our price on the Flashmax series of Cree LED Flashlights is lower than anywhere else on the internet! This sure looks like a Ultra Fire MCE-1000L, is it? That is one brand name this product is marketed under, yes. I don't understand metric measurements, can you give me the size in inches?